This kit contains all hardware to connect boat mounted, push-pull, mechanical steering to 5 thru 8 models. Cable-over-pullet steering equipped boats require steering pulleys and lap links not provided in this kit. Use steering system components that comply with ABYC (American Boat and Yacht Council) standards. 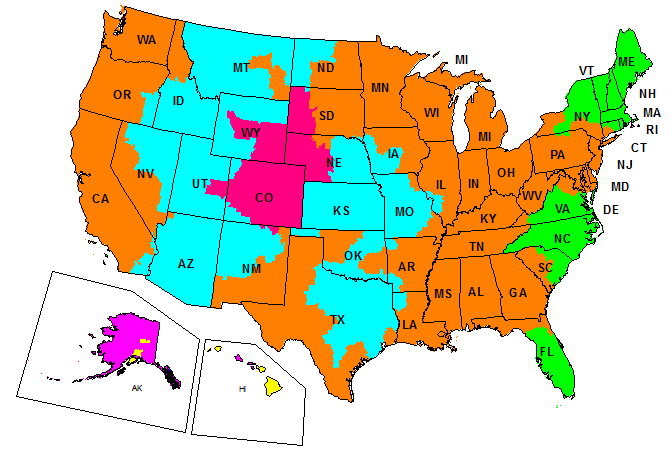 For help to select steering components, see your DEALER. Read these instructions completely before starting work. Retain these installation instructions with your Operator's Manual. They contain installation and maintenance information for future reference. Apply grease to all threads and pivot points for lubrication and corrosion protection. When grease is specified use Triple-Guard® grease. Make no dry assemblies. Assemble spacer (3) onto pivot screw (4) apply liberal coat of grease to screw and spacer. Install clevis (5) on pivot screw with offset facing hex head. Install spacer nut (2) onto pivot screw and tighten securely. Install steering bracket (8) onto pivot screw as shown. Install locknut (1). Tighten to a torque of 18-20 ft. lbs. (24-27 Nm). 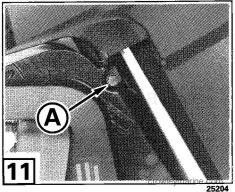 Obtain lap link (A) P/N 304411 and steering pulley (B) P/N 976366 from your DEALER. Install items on steering bracket (8) as shown. Lay motor down. Turn swivel bracket to starboard. Align steering bracket with threaded holes in steering arm. 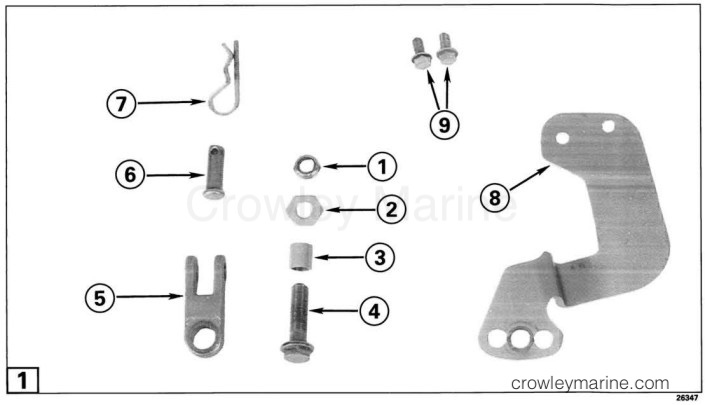 Install mounting screws (9). Tighten screws to a torque of 60-70 in. lbs. (7-9 Nm). Mount motor on center of transom. Install the optional transom plate (C) and motor mounting hardware (not provided). See your DEALER. Route steering cable through pulleys and secure to cable anchor straps (not provided). See your DEALER for other items required but not provided. Install boat mounted steering cable bracket to transom. For procedure, refer to steering system manufacturers instructions. Turn steering wheel to extend steering cable. Apply a light even coat of grease to steering cable jacket guide. Apply grease to steering cable ram hole and pivot pin (6). Align cable ram and clevis holes and install pivot pin. Install retainer clip (7) onto pivot pin. Loosen steering friction screw (A) on swivel bracket. Turn steering wheel from lock to lock to check for smooth operation without binding. Make sure shift and throttle cables and steering components do not interfere with tilting of the motor. If so, reroute them to provide clearance.